What Can I Expect with Dental Implants in Massapequa? Are you tired of feeling self-conscious about your smile due to missing teeth? Are you ready to enjoy your favorite foods again? If so, dental implants in Massapequa are the solution for you. Dental implants are the most preferred form of tooth replacement because they are permanent and offer over a 95% success rate. However, unlike other forms of dental prosthetics, like dentures, it does involve a multi-phased treatment process. As a result, you are sure to have plenty of questions. At South Shore Dental Care, we understand your concerns. We have the information you need about the dental implant procedure. In most cases, as long as you have healthy gums and adequate bone density, you are a candidate for dental implants. However, you will need to go through a comprehensive evaluation. During the evaluation, x-rays or a 3D CT scan will be taken to access your gum and bone health. These images are also used to determine the best area for the implant placement. Impressions of your mouth are taken as well to create a replica of your teeth and gums. We will also discuss your lifestyle and medical history. In some cases, you may need additional procedures prior to the implant placement, such as tooth extractions or bone grafting. These will be performed before the implant posts can be placed. You will need to be fully healed from these procedures before we can move forward. The first phase of treatment involves surgically placing the biocompatible titanium implant post into the jawbone. The gum tissue is opened and a hole is drilled into the jawbone. The post is placed into the hole to replace the tooth root and the gum tissue will be sutured closed. Over the next few weeks, you will heal, allowing the jawbone to fuse to the implant post. After your jawbone has healed, you will need a second minor surgery to place the abutment. The abutment is needed to attach the restoration to the implant post. In addition, it allows the gum tissue to heal correctly. The gum tissue is opened to expose the implant post and the abutment is placed. A couple of weeks after the abutment is placed, you are ready for the restoration process. A custom-made dental crown is attached to the abutment to complete your new smile. 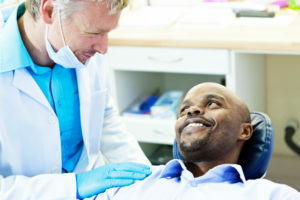 Although you are now finished with the procedure, you will require follow up care with your Massapequa dentist. We will ensure you are healing correctly and maintaining your oral hygiene to promote the long-term success of the procedure. If you are ready to improve your confidence and quality of life with dental implants, South Shore Dental Care can help. We will perform the consultation necessary to ensure you are a candidate for the procedure and create the customized treatment plan you need for a complete smile. Contact our office today to schedule your consultation. by: Dr. Stutman's Office at May 28, 2017 . Comments Off on What Can I Expect with Dental Implants in Massapequa?